7-Eleven will not be selling the infamous magazine at company-operated stores, a spokesperson wrote in an e-mail to HuffPost. The convenience store will also be encouraging their franchisees to do the same. The decision comes one day after a spokesperson told HuffPost 7-Eleven would continue to sell the magazine. 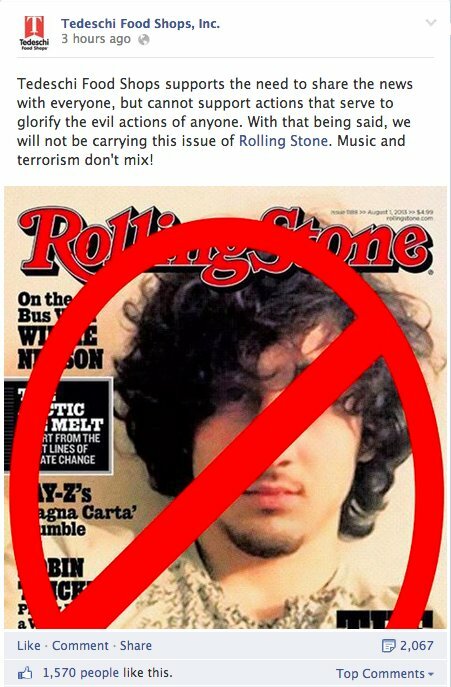 The controversial cover, which accompanies a profile of Tsarnaev, sparked outcry on social media and elsewhere after it was released. UPDATE: This post has been updated to include statements from Walgreens, 7-Eleven, Rite Aid and Kmart. This post has also been updated to include a revised statement from 7-Eleven.